A naturalist reveals some of the wonders of the natural world found right around the Washington, DC Metropolitan area using his own photography and his life-long experiences. I invite you to also check out my other award winning social media platforms: Facebook Group "Capital Naturalist" or YouTube Channel (https://www.youtube.com/channel/UCv8LHf1hHCEU3UHdpb-8Mng) or follow me on Twitter: @CapNaturalist. Queen Anne's Lace at the edge of a field. 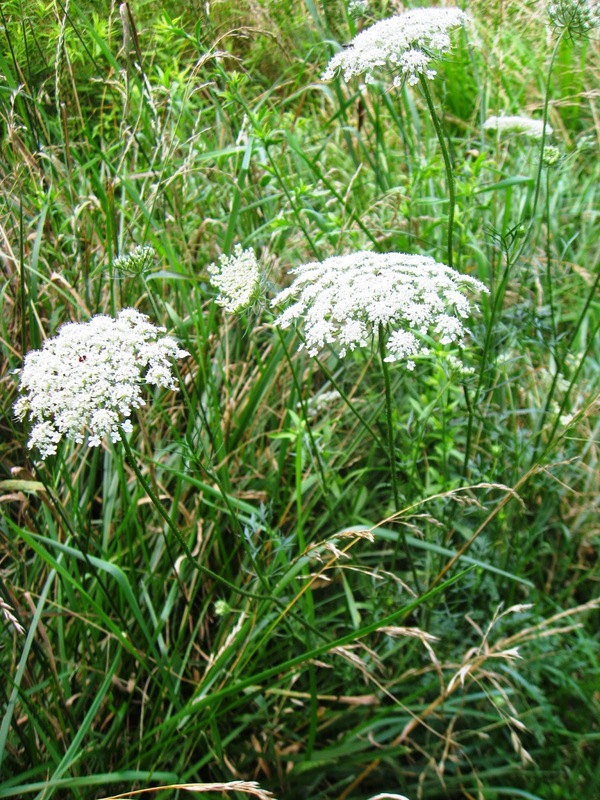 Many of the white flowers that are found in abundance in our open fields and road edges at this time are Queen Anne's Lace (Daucus carota ), sometimes called Wild Carrots. Our modern carrots are indeed descendants of a subspecies of this plant. 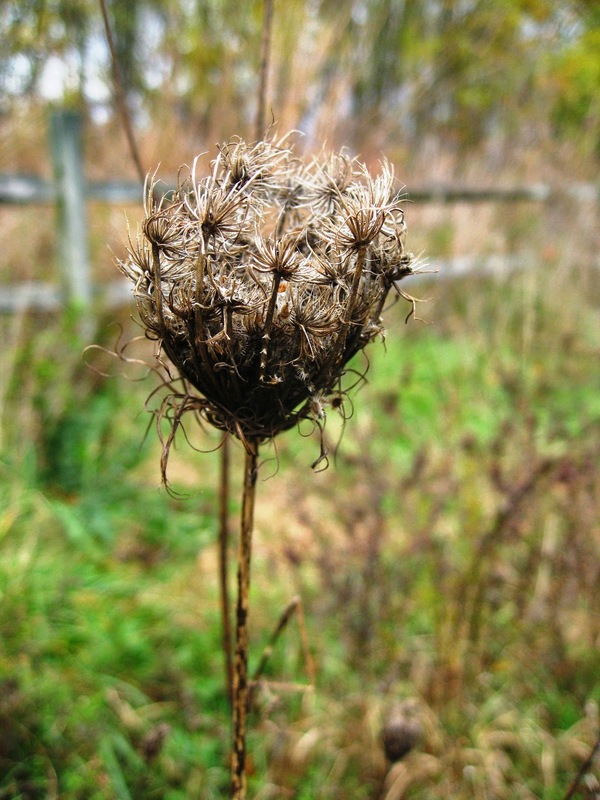 This plant is normally a biennial, flowering in its second year before it dies, but it sometimes takes 3-4 years for it to bloom if growing conditions are poor. It often grows to 3 feet tall and starts blooming from the outside of its flower cluster towards the middle, often blooming for a month or longer. Once done, the flower head dries and curls inwards. This resembles a bird's nest and the plants indeed are sometimes called Bird's Nests. Like our modern carrots and so many other members of the parsley/carrot family, they are edible, or at least the roots are when young and before they get woody, However, some other members of the family also have similar fern-like foliage and white flowers in flat clusters (umbels) but are actually poisonous (such as Poison and Water Hemlocks). There are differences though, and none have the carrot-like odor to their roots. If you do decide to try them, please make sure of your identification and also note that some people get a rash after handling the leaves if they are out in the sun, a common trait when skin is exposed to chemicals found in many members of the carrot family. Queen Anne's Lace is not native but has naturalized here from Eurasia. In fact, in many areas it is considered invasive, particularly in open, sunny areas with clay soils. It of course was eaten in its native lands, but was also used as to obtain a cream-colored dye derived from the flowers. It had been cultivated in a variety of root colors originally ("carrot" is derived from a Celtic word for "red" for example). Orange though now is the color we associate with most commercially available ones. This came about, it is believed, due to the 16th century Dutch who bred them this color in honor of the royal House of Orange. It's common name supposedly came about from an ancient legend. Queen Anne (either of Great Britain or Denmark depending on the version of the tale) was said to love to make lace. While "tatting" (making lace by hand), she supposedly pricked her finger and a drop of blood fell onto its center. The lace she was making became the white flowers of Queen Anne's Lace, with the reddish/purple sterile central floret most of the plants are adorned with being the spot where her blood droplet fell. A Queen Anne's Lace flower umbel. If you look closely you can see the dark central floret. While this plant is not native and can in some locations even be considered invasive, it is here to stay. It can be beneficial as well. Some people know how attractive it is not just to many pollinators, but also wasps that can prey on insect pests. It is even recommended as a companion plant to certain crops by some farmers. One creature that has benefited is the Black Swallowtail Butterfly. 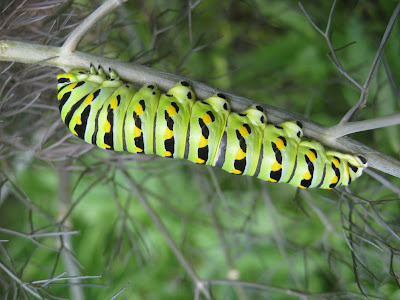 Its caterpillars use many members of the parsley/carrot family for a host plant, including Queen Anne's Lace. So many interesting things to know about this common field plant that is often not even noticed unless it is in bloom. In honor of National Pollinator Week, it makes sense to honor the best animal pollinators: bees. Most people are aware of how important bees are for pollination of plants, including some 70% of our crops. What they do not often realize is that we have some 400 or so native bee species in our region, most of which are not at all like the introduced European Honeybee. Honeybees were introduced into the USA in Jamestown, Virginia, in 1627. They are of course extremely valuable for the way we conduct our agriculture and to give us honey, but we need to realize that wild plants were doing fine (maybe even better) before these generalist bees arrived. While most people think that all bees are like European honeybees (living in hives with a queen, making honey, and only capable of stinging once), this really is the exception and applies to these introduced bees rather than most of the other 4,000 or so other species we have in North America. The vast majority of our bees for example are actually solitary, with a single female bee taking care of her young, collecting nectar and pollen for them all by herself. She is extremely non-aggressive and many are incapable of even having their stingers pierce our skin. Should that happen however, multiple defensive stings are possible. The reason bees do not do so however is that they would prefer to fly away and not defend their nest, for if the solitary mother dies, her nest and eggs are dead anyways. Better to fly away and start over. Honeybees live for the hive, the workers themselves really not even reproducing, so all they care about is defending their nest, even if they lose their lives stinging in the process. 70% of all bees live underground, usually in burrows they dig and then provision with nectar and pollen for their developing young. While each solitary bee lives by herself and takes on all the work alone, if the habitat is right, many female bees may nest near each other. Good real estate in a nice neighborhood can be hard to find. After collecting enough food and laying eggs, the bee dies and the bee larvae develop on their own until they emerge, often the next year. Another thing many people do not realize is that although bees can visit many different types of flowers to feed on themselves, almost half of our native species are specialists in the type of pollen they need to feed their young. These specialist bees, often needing the pollen of a single family, genus, or even a single species of flower, are called oligolectic bees. If the specific (normally native) flowers are not available, the bees cannot reproduce. This is another reason to include a great diversity of native flowers in our yards and preserve them in our parks. They need the flowers they evolved with or they simply cannot survive. The one shown above is usually called the Hibiscus Bee, Ptilothrix bombiformis, which needs pollen from plants in the Mallow family (including hibiscus) to reproduce. These I noticed digging their burrows in one of our Natural Resource Conservation Areas, Arlington Forest Park. They do indeed look like a bumble bee (thus the scientific epithet bombiformis meaning "in the form of a bumblebee") but unlike them, they dig solitary burrows in the ground. Thanks to friend and colleague Sam Droege, one of the best bee guys in the country, for the help in identification. These bees are remarkable in that they not only dig their burrows, but carry water over on their fuzzy bodies to wet the ground enough to help them in their excavation. The dirt they pull out is often formed into little turrets that surround the entrance to their hole. They are living in this park because they have the bare, well-drained ground they need, a water source nearby, and of course the plants in the Mallow family that they love. This is about the time of year I start receiving calls regarding wasps nesting in our sand volleyball and tot playgrounds. More often than not, what everyone is asking about are Sand Digger Wasps. These are solitary wasps (one female per hole) but which can aggregate in large colonies when the conditions are right. They prefer open, sunny locations with soft, clean, and often lighter colored sand. That unfortunately is just what we strive for in our sand lots. The most common species we encounter locally is Bicyrtes quadrifasciatus, a stinkbug and leaf-footed bug specialist. In other parts of the country, they have species that go after flies. These are then actually beneficial insects. Each female digs her own tunnel (up to a foot deep) and then brings back stinkbugs she has stung and paralyzed. This she takes down her burrow and the paralyzed prey then acts as the living food for her larvae. Though they can look intimidating flying over the sand, they are actually extremely unlikely to sting unless actually grabbed. 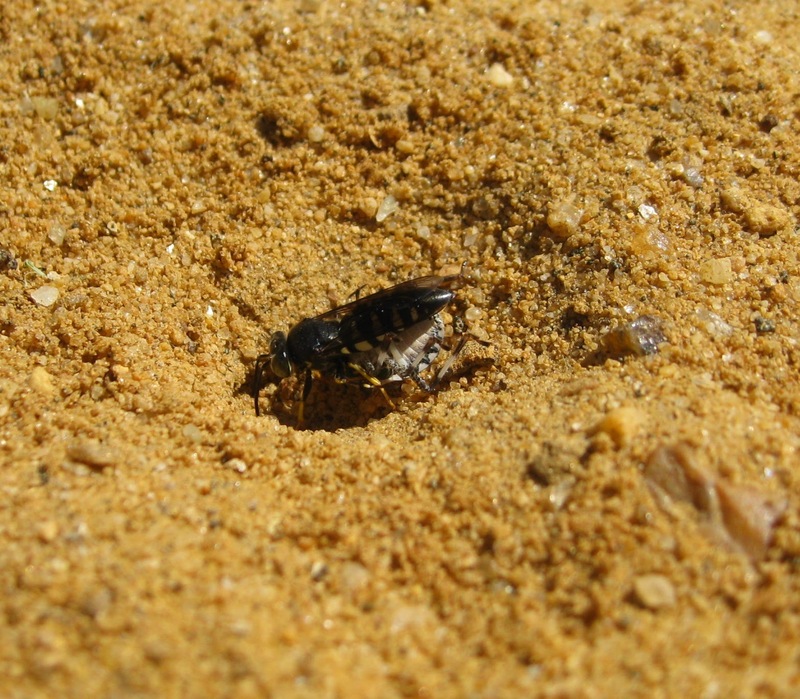 In fact, most of the ones flying over the sand are actually males who cannot sting at all. In the world of bees, wasps, and ants, only females (of the few species who can sting at all) can sting, because the stinger is actually a modified ovipositor (egg-layer). Males of course do not lay eggs and so therefore cannot have a stinger. 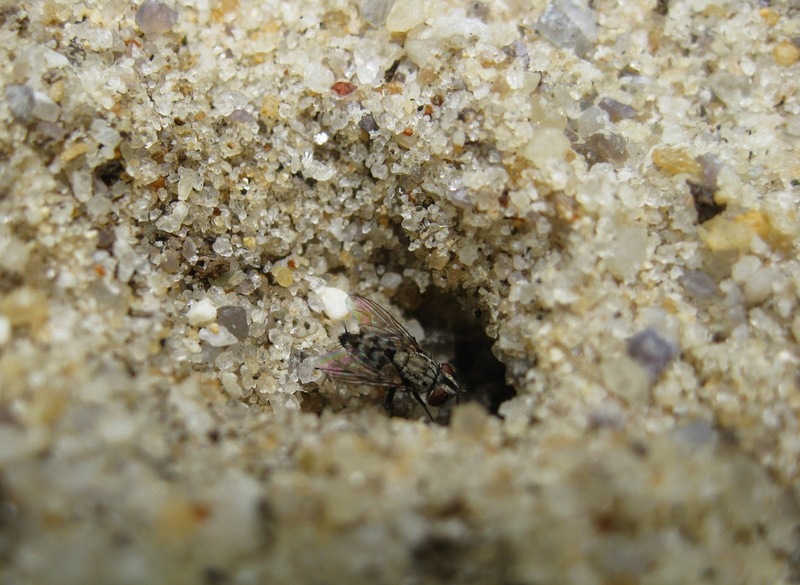 Sand Digger Wasps are only are active for a little over a month, but this happens when the sand lots are in great demand for the summer. Every year, complaints come in and we need to educate people about their pollination and stinkbug control benefits. Ideally we would just close down the lots for the time they are nesting, but that is not practical. We are experimenting with various methods to deal with or discourage them. Unfortunately making the area more shady and changing the type of sand is not very well received by the public either. Pesticides are also of course out of the question (more dangerous to kids/public than the critters themselves), as is covering the area up or flooding them (sand drains too well anyways). We are also tilling and sifting the areas they use once the season is over, since they show nest site fidelity (nest in the same area they were born). This hopefully means less of them the following year. We have many other locations for them and they are beneficial, but we need to have them not take up residence in the sand playgrounds. I suspect that Sand Digger Wasps are actually increasing in numbers not only because we have increased what once was an uncommon habitat (sunny sand lots with no plants growing), but because we have so many stinkbugs. I think they are benefiting because they are now preying on the invasive exotic Marmorated Stinkbugs that are not only a nuisance in our homes, but cause great agricultural harm. People may have noticed how much of a problem and how numerous these invasives were before, and how much fewer we have now in certain locales. As I have said, sand wasps are very beneficial if we can just get them to do their good work in other locations. Another interesting association with them is a neat little Satellite Fly that parasatizes these wasps. These can be seen following the sand wasps around and waiting for them to open up their burrows once they arrive to them. I have not identified the species yet, only that they are Miltogrammine flies. Once they get an opportunity, they lay their eggs on or next to the paralyzed stinkbug. The fly is a kleptoparasite, meaning its maggot steals the food and often kills the wasp larva in the process. 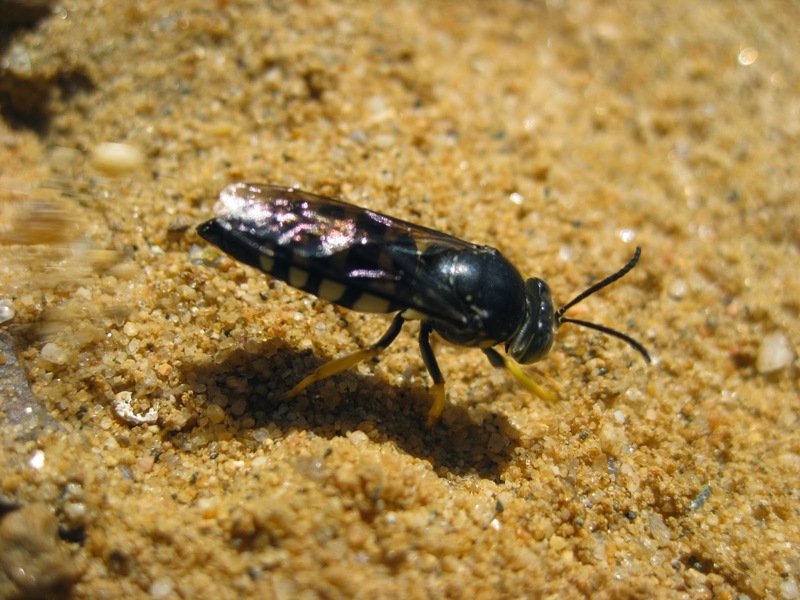 The sand wasp goes through all that work to feed the fly. I'm often amazed at all the drama that goes on in miniature right under our noses. Here we have wasps who use our playgrounds to raise their young. They do this by providing a paralyzed living food source for their babies (perhaps controlling an invasive pest in the process). But waiting in the wings is a fly who steals the food and kills the wasps larvae. All of this drama taking place less than one foot underground where our children play. Its easy to see why people might get upset, but we need to realize this part of a natural cycle. These wasps are providing a valuable benefit in pollination and controlling stinkbug pests as well, and are harmless to us anyways. Please let others know so maybe we can all figure out a way to share the same space, if only for a month during summer.